WOW! Women On Writing Blog: Ruth Hartman, author of My Life in Mental Chains, Launches her Blog Tour! I'll be checking in to this post throughout the day to check comments and answer any questions you may have. Thanks for sharing today. I have a question. How do you decide which events to include in a memoir and which events to leave out. So many things happen to us EVERY DAY, so what drives your decisions? For this memoir, I had to narrow down the events that had to do with OCD. I tried to include my feelings at that time, and also how other people's words and actions affected me. Memoirs can be about so many different things. Using a filter for the focus of your particular subject would be the best route to take. As I wrote this, I ended up scrapping a lot of material. Once I read it, it didn't really seem important to this particular story. This sounds like a really interesting read. I don't suffer from OCD, but I know several people who are borderline. Thanks for sharing your story. I'll have to check for this book if I don't happen to be the winner. Hi, I feel for you. My son is OCD and won't get treatment. It hurts to watch him. Thank you for talking about this. My ex-husband suffers with OCD. We were married for 16 years (not the reason for the divorce). His did not seem too bad but it was still painful watching him go through it. He still will not recieve treatment though. Thank you for sharing your experiences and I cannot wait to pick the book up and read more. I was never officially diagnosed with OCD, but a lot of my behaviors when I was in my 20s and 30s (specific placement of things on tabletops in my house, door lock checking, hand washing, categorizing and label alignment in pantry and 'fridge, alphabetized everything, spreadsheets and cataloging, and so much more) suggested that I was at least borderline. But in the last 6 years, I just haven't been able to keep up with my "orderly" life around my husband and teen son, so although untidiness sounds like constant white noise in the back of my head, I don't feel the same compulsion I once did to do something about it. Ruth, I'm glad you found a way out of your OCD darkness. I'm sure your book will be a great help to many people out there who are suffering. I look forward to reading about your journey! Best of luck in your promotional efforts! Thanks for your interst in the book. I hope it will help your friends/family members who have OCD. It's because of caring people like you, that those of us who suffer are helped. I feel for your son. I understand the pain he's going through all too well. And you are in the same pain watching him, that my family was in with me. I'm so sorry about your ex-husband. No matter how slight or severe, OCD takes its toll on the person who suffers with it, and those around them. Thank you for your kind words. I appreciate your support! I'm so glad to hear your OCD has improved over time. That's wonderful! Thank you very much for your kind words of support. 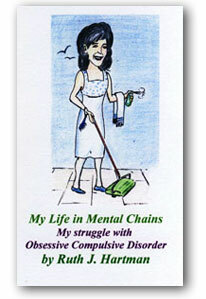 Ruth, You've taken quite a journey, from ocd to memoir, and are to be commended for turning it into a positive outcome! Best wishes on your blog tour, I'm looking forward to hosting you next month! I'm really looking forward to being on your blog, as well! Ealier today, I had the privilege of handing a copy of my book to my psychiatrist. He was moved. So was I. He and I went through so much together. It was the best way I could think of to thank him. It's interesting to see how many people have had an experience with either a loved one or a friend with OCD. I was talking to my hubby last night and he told me about one of his friends with OCD as well. I'm so glad you're sharing your experience with others. We don't often get to read a memoir that looks inside OCD! I commend you for writing this book and opening up the dialogue. It's an important topic, and you're so honest. That's one of the things I love about you. Big hugs, and congrats on your launch! Thanks Ang! And thanks to everyone who worked on this blog tour. You guys are the greatest! I've really enjoyed today! Congratulations Ruth!! Good luck with your blog tour and promotion of your important book! Thanks for your support. It really helps to know your friends are supporting you! Thank you for sharing a story not often enough discussed, even if it is more around us and our friends and relations in this country than known. I'm also interested in seeing more about your next work too, sounds interesting. Best of luck with your tour, life, your writing, and thanks for sharing with us! Thanks for your interest in my book, and future writing. I appreciate it! Ruth~ Life is hard enough having to cope with the day to day things that come along...then to add your OCD on top of it. You reached inside and came out right where you needed to be. I don't know you, but I'm proud of you and what you are doing for others. Thank you so much for your sweet, kind words. I appreciate it more than you'll ever know! Thanks for all your comments! We've officially picked a winner of Ruth Hartman's book. Drum roll... and the winner is Jo Ann Hernandez! Congratulations, Jo Ann! If you'd like to e-mail me at rghartman@aol.com with your address, I'll send you the book! Thank you, Ruth, for telling your story. So many will benefit from your honesty. Thank you for your support. It was a hard book to write, but it really helps to know it may help someone someday.